What is your opening argument? Do you have a mission statement, a burning question, a call to action or a set of values that guide you? 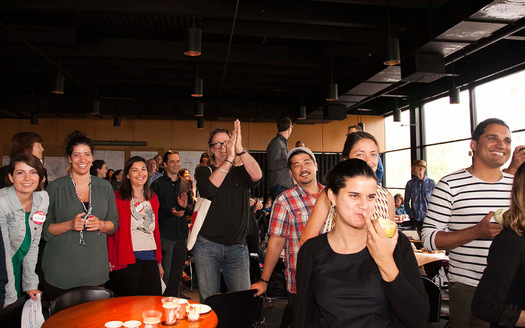 Participants who attended the LEAP Symposium were asked to send their opening arguments before arriving for the event organized by Designmatters at Art Center College of Design, in Pasadena, CA. 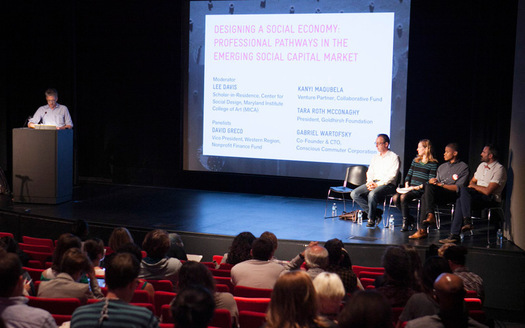 Their responses were used to spark dialog around the emerging career pathways for designers in the social innovation space. While these challenges seem daunting, participants were in good hands, in large part thanks to the vision of the LEAP brain trust — Mariana Amatullo, Allan Chochinov, Lee Davis, William Drenttel, Robert Fabricant, and Jocelyn Wyatt — who opened the symposium. Kolko’s sentiment resonated with the first group I joined, which had about 20 members. We huddled on stools, within a couple of feet of each other, while facing a wall of printouts that showed our opening arguments. Our goal for this first day was to “capture insights through collective knowledge sharing” and we had a lot to start with. 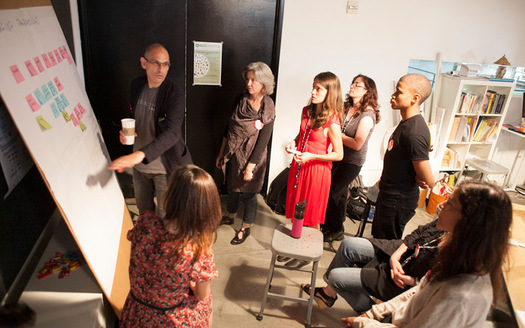 Each of us pointed to arguments, phrases or even words that underscored timely topics and themes, starting with the importance of educating design students to be morally or ethically grounded. 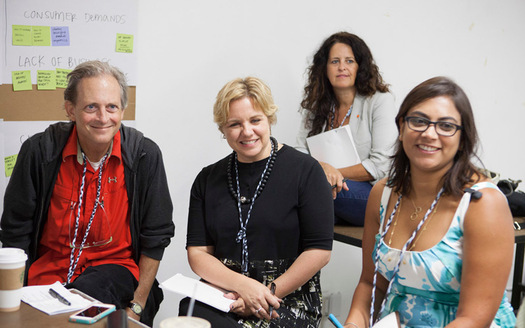 Our group’s small army of experienced facilitators led by Art Center product design chair Karen Hofmann made sure that we explored a range of topics. Most members identified the need to create new educational curriculum that prepares designers to tackle a wider range of needs though some questioned whether design programs are responding to a demand for social designers or if they are merely creating supply? Others highlighted the importance of creating more transparency around the design process in order to better educate the public about the value designers provide organizations. The group’s wide range of questions and concerns reflect the eclectic backgrounds of LEAP participants. Each of the five groups included a mix of 40% non-designers (private sector, public sector and social enterprise) and 60% designers (educators, practitioners, recent design graduates and students). The fast-paced conversation had some people spinning in their stools. 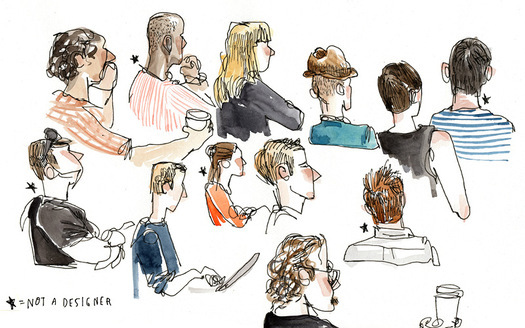 Meanwhile, photographers shot every angle, illustrators drew caricatures of animated participants and visualized quotations, videographers captured the energy of conversations and writers documented the ideas being exchanged. Inspiration came throughout the symposium and perhaps most notably from the panels and speakers. Robert Fabricant moderated the first panel, which featured two speakers who work at the intersection of public and private sectors. Bryan Boyer spoke first and reflected on his experiences at SITRA and Helsinki Design Lab. He was joined on the stage with Christopher Fabian, an innovation adviser at UNICEF. Both want designers to be woven into the fabric of organizations so that they share the same constraints as non-designers. From Fabian’s experience, “only 5% of innovation is technology. The rest is people.” With that in mind, both agreed that system-size design solutions should be user-driven, built where they are being used and implemented, modifiable and open-sourced so others can adapt and use the innovations. Facilitators elevated the discussions throughout the symposium. When I joined Jocelyn Wyatt’s group that afternoon, she had already reviewed her group’s conversation from the morning session and wove their ideas into six sub-categories that flowed together seamlessly. As she put it: “Our goal is to educate better-prepared designers, so they can better-communicate their skills, and demonstrate the impact of design, to convince people of design’s value so they want to pay for it, which would improve communities, and lead to better design jobs.” Participants broke into applause when she completed her impressive summary. It enabled them to think big about the next phase of the process, which involved posing questions around each of those topics to inform the focal points of the next couple of days. The first day concluded in Art Center’s Film Sound Stage, a room full of props, sets and stage lights, where a Art Center student and alumni presented examples of their social impact work to keep us inspired. Graphic design student Geoff Brewerton spoke about his work in Myanmar with Proximity Designs, where among other projects, he taught farmers how to make instructional videos so they could share their best farming practices with each other. For example, one video shows an experienced rice farmer talking about the fact that there is a limit to how many seeds you can plant in rice paddies; the total yield of rice will decrease if there are too many seeds planted. This bit of farming wisdom came to symbolize my impression of LEAP. Its balance of diverse participants, working sessions, panels, workshops and time to connect with others fostered collaborations that energized the weekend. Participants joined new groups on day two based on their interest in a refined batch of topics that emerged from day one. They were charged with envisioning new opportunities for designers and chose from one of the following five topics: capturing and communicating the value design brings to social impact, leveraging emerging models and platforms to enable and sustain collaboration and partnerships, building a stronger network of social impact design, identifying imperatives in social impact design education, and broadening access to design for social impact organizations. 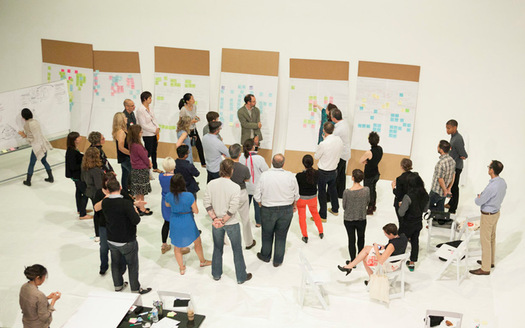 Nearly 20 subgroups formed within each category that focused on a range of topics: effective models of social impact, the skillset that social designers need to develop, ways to develop business models that would foster a new generation of design entrepreneurs, networks of socially-focused organizations that designers could rely on and many more. Groups explored their topic to better understand, prototype and play out scenarios that address each. Funding social impact work remains one of our community’s most pressing challenges, which is why the afternoon panel focused on the trends of a new “social economy.” Panelist represented various perspectives within this community and spoke about the opportunities for design entrepreneurs to shape this new economy, starting with David Greco, from Nonprofit Finance Fund. Kanyi Maqubela, a Venture Partner at the Collaborative Fund invests in technology. Tara Roth McConaghy’s company, Goldhirsh Foundation, “finds smart people doing creative things, and gives them the financial, social, and human capital to do them better.” Lastly, Gabriel Wartofsky represented the design entrepreneur. He spoke about designing the electric bikes that his company, Conscious Commuter Corporation, has developed into a business. When they asked what role design could play, the group quickly pointed to designer’s ability to translate raw content into compelling stories, to rethink systems, create processes and communicate impact. They encouraged designers to incorporate interdisciplinary skills and reframe how they talk about themselves to people who do not know what designers do. Maqubela challenged designers to learn how to learn challenged, and to think broadly about the definition of technology. “Remember that technology is anything that radically solves problems,” he said. Lee Davis hosted the afternoon session that featured three speakers with very different approaches to putting people first. Henry Posko described the importance of moving his human resource business, HUMANIM, to a depressed area of East Baltimore to better reach the people they serve. Elizabeth Scharpf talked about building her business, SHE, which manufactures and distributes affordable, eco-friendly menstrual pads for girls and women by sourcing local, inexpensive raw materials, like banana leaves. Kyla Fullenwider wrapped up the session by discussing how her company, Imperative, finds ways to “maximize the purpose and well-being of their employees, customers, and communities” by, for example, measuring qualitative aspects of organizations, like employee happiness. 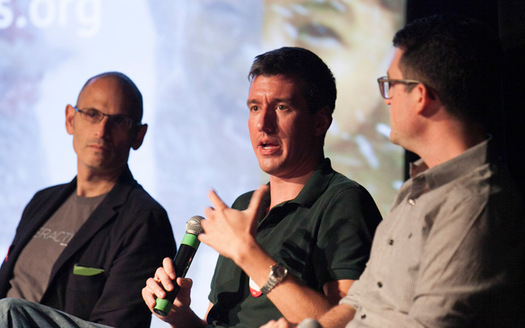 All three speakers embody the kind of determination that social designers need to operate in unfamiliar terrain. The day ended with three workshops hosted by LEAP partners who regularly support the efforts of social innovators: GOOD, Verb and National Collegiate Inventors and Innovator’s Alliance (NCIIA). The final morning promised to be chaotic since each group had only a couple of hours to create a poster that summarized their idea. Many visualized their ideas with a range of illustrations, from astronauts and wizards, to puzzles, globes, light bulbs, flowcharts and lots of arrows. The room was full with a sense of celebration by the time each group finished and had presented their posters, with names like “Skill Swingers,” “the Collabinator” and “Business Model Canvas.” Beyond the playful names and drawings, these posters represent exciting plans that will go forward: redesigned education models, a matrix to guide project of different complexity and scale, sustainable business models, supportive networks for social impact designers, initiatives that diversify the field of design and many more. Participants continued discussing ideas over lunch, as wondered around the room to see each poster in more detail. 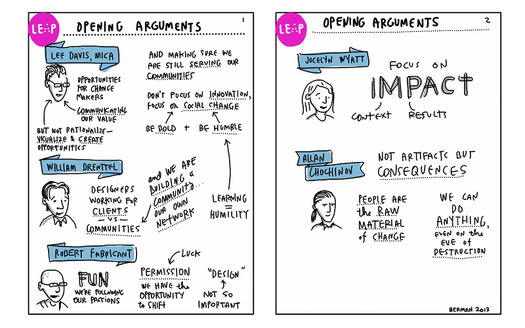 LEAP was designed to cultivate the kinds of insights that can help designers advance as social innovators and it became clear that everyone left the symposium with renewed enthusiasm for designs potential in the social innovations space. While the challenges facing our community may seem overwhelming, LEAP demonstrated that we have the energy, expertise and honesty to address them. 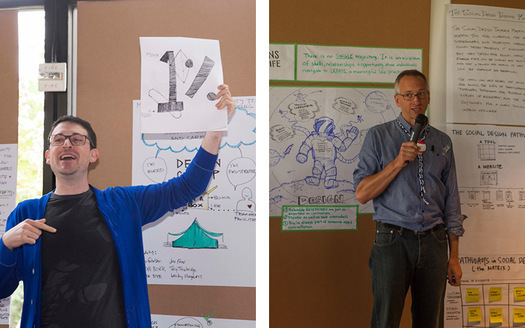 ©2013 Alex Aristei for LEAP Symposium (LEFT: William Drenttel, CENTER: Mariana Aatullo). Andrew Shea is a graphic designer, writer, and educator who has taught graphic design at Maryland Institute College of Art, Fordham University, Parsons The New School for Design and Pratt Institute. Shea is partner of the New York based studio MANY and his writing has appeared at Core77, AIGA, Design Observer, Entrepreneurial Magazine, Designer’s Review of Books, and GOOD. 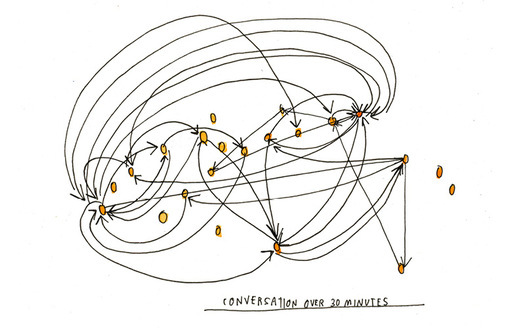 How a disruption in routine (potentially by design) can alter the environment.